PRINCETON, N.J. -- Republicans and Democrats have starkly different interpretations of what the recent mass shooting at an Orlando nightclub represents. 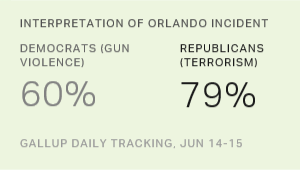 While 79% of Republicans view it primarily as an act of Islamic terrorism, the majority of Democrats, 60%, see it as an act of domestic gun violence. Given Republicans' more lopsided views, Americans as a whole tilt toward describing it as a terrorist act. From what you know or have heard, do you view the incident in Orlando over the weekend as more -- [ROTATED: An act of Islamic terrorism (or more) an act of domestic gun violence]? The results are based on a June 14-15 Gallup poll, conducted days after a Muslim U.S. citizen, Omar Mateen, perpetrated the deadliest mass shooting in U.S. history at an Orlando nightclub. Mateen had been listed on the federal government's terrorism watch list in 2013 and 2014, but was later removed. While both President Barack Obama and presumptive Democratic presidential nominee Hillary Clinton described the incident as an act of terror, presumptive Republican presidential nominee Donald Trump went further, tying the act to radical Islam. Democrats' interpretation of the Orlando shooting may be influenced by Democratic leaders' calls for stricter gun laws in recent days. This was exemplified by a Democratic-led filibuster on the Senate floor Wednesday and Thursday, which ended after Republican leaders agreed to take up proposals on background checks and steps to prevent terrorists from obtaining guns. Trump's statements on the event may be contributing to Republicans' views of the Orlando incident as an act of Islamic terrorism, but Republicans' tendency to define it as terrorism may also stem from their greater concern about terrorism in general. Independents are evenly divided as to whether the Orlando shooting was an act of Islamic terrorism (44%) or domestic gun violence (42%). Whether the Orlando incident was inspired by Islamic terrorism or the actions of a killer able to obtain guns is a debate that cannot be easily settled and, regardless, does nothing to diminish the tragedy of the event. But it is clear that Americans' political views influence how they interpret the tragedy and, by extension, shape their views of the policies leaders should pursue to prevent similar incidents. Americans are most likely to believe banning gun sales to suspected terrorists would be most effective of seven steps the government could take to prevent future incidents like the Orlando shooting. Eighty percent of Americans believe such a move would be very or somewhat effective, including 84% of Democrats and 75% of Republicans. At least six in 10 Americans also believe increasing U.S. airstrikes against the Islamic State or ISIS, changing state gun laws to allow more people to carry concealed weapons, and passing new laws to make it harder to buy assault weapons would be effective in preventing a repeat of the Orlando attack. The last two proposals garner almost identical public support, although one involves tightening gun restrictions and the other loosening them. Many fewer think banning Muslims from entering the U.S., a move that Trump has specifically promoted, or requiring Muslims living in the U.S. to carry special IDs would be effective. How effective do you think each of the following will be in preventing incidents such as the one that happened in Orlando this past weekend -- very effective, somewhat effective, not too effective or not at all effective? A new law that would prevent any Muslim from entering the U.S.
A wide partisan divide exists on all proposals except banning gun sales to suspected terrorists. More than eight in 10 Republicans believe increased airstrikes against the Islamic State and changing state gun laws to allow more Americans to carry concealed weapons would be effective in preventing similar incidents. Meanwhile, most Democrats think passing new laws regarding assault weapons and limiting the sale of ammunition magazines would be effective. A majority of Republicans, 54%, think the Trump-favored ban on Muslims would be effective at preventing similar incidents like the one in Orlando, but only 14% of Democrats agree. Because Mateen was born in the U.S. and lived there throughout his life, such a policy would not have prevented the Orlando incident. The Orlando tragedy will long be remembered for the scope of the attack, ranking as the largest mass shooting in U.S. history. Given that it was orchestrated by a person of the Islamic faith who claimed allegiance to terrorist groups and who targeted gays and lesbians, the crime has elements of a mass shooting, terrorism and a hate crime. In its aftermath, Americans' political leaders are trying to sort out what measures the government can take to prevent a reoccurrence. How Americans interpret the event undoubtedly influences what steps they favor, but it may also be that their policy preferences and partisanship influence their interpretations of the event. Although the proposals members of both parties have put forth are surely well-intentioned, Democrats are focusing their efforts on advancing gun control legislation they long have favored, while Republicans are renewing their calls for tougher anti-terrorism efforts. Where those two agendas intersect -- namely in taking steps to prevent terrorists from obtaining guns -- may be the place where lawmakers are most likely to find enough common ground to pass new laws. 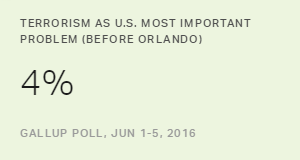 It is also the policy Americans are most likely to view as effective in preventing a repeat of the Orlando tragedy. Results for this Gallup poll are based on telephone interviews conducted June 14-15, 2016, on the Gallup U.S. Daily survey, with a random sample of 1,021adults, aged 18 and older, living in all 50 U.S. states and the District of Columbia. For results based on the total sample of national adults, the margin of sampling error is ±4 percentage points at the 95% confidence level. For results based on the total samples of 319 Democrats, 311 Republicans and 349 independents, the margin of sampling error is ±7 percentage points at the 95% confidence level. The Orlando massacre Sunday may cause Americans once again to say terrorism or guns are the nation's most important problem, as they did last December after the Paris and San Bernardino attacks.